Merle Oberon. Died: From injuries sustained in a cycling accident, in California, 1 October 1988. In The Art of the Cinematographer , by Leonard Maltin, New York, 1978. Lucien Ballard has to be ranked among the greatest of Hollywood cinematographers based on a distinguished career which stretched from the early days of talkies into the blockbuster era of the 1970s. During more than four decades he worked on an extraordinary number of visually interesting films, in particular Buchanan Rides Alone , The Rise and Fall of Legs Diamond , and Ride the High Country . His creative output seems to divide into five periods. He began his career at Paramount as editor and assistant to the great cameraman Lee Garmes on Josef von Sternberg's Morocco , starring Marlene Dietrich. Taken under von Sternberg's wing as a protégé, Ballard worked on The Devil Is a Woman and Crime and Punishment . It is hard to think of a more inspirational training ground for exploring the possibilities of light and shadow in the cinema than to have worked with Josef von Sternberg in the 1930s. 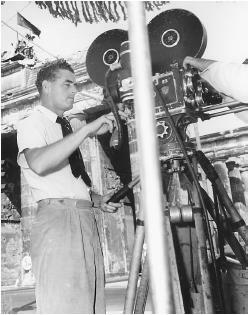 World War II, with many talented cameramen off working for the military, provided Lucien Ballard with his chance to move up to top Hollywood productions. He jumped from Columbia, the home of the "B" movie to Twentieth Century-Fox, a top studio. In the mid-1940s he became a bit of a celebrity as the husband of Merle Oberon and the cameraman who struggled with Howard Hughes to create the idiosyncratic Western, The Outlaw . But then his career stuck and he returned to shooting lower-budget fare. He achieved a measure of excellence with The Killer Is Loose and Buchanan Rides Alone for Budd Boetticher, and The Killing for Stanley Kubrick. In 1962 his career took a turn for the better and he began to achieve fame as an exceptional cameraman with work for director Sam Peckinpah. Their Ride the High Country stands as one of the most beautiful of Westerns; The Wild Bunch , The Ballad of Cable Hogue , and Junior Bonner brought Ballard and Peckinpah much due recognition and acclaim. This final phase of Ballard's career was underlined with greatness for the clean, elegant visual style he brought to the Western just, ironically, as that form was passing from the movie screen.